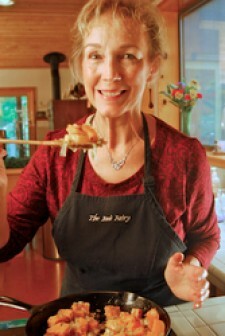 In preparation for her 20th Anniversary Terri McClernon of The FoodFairy.com has added 2 new associates (foodfairyettes) to her remarkable personal chef and catering business. Terri announces a new service area in the Catskills of New York. August 25, 2015	(Press Release) - Terri McClernon is "over the moon" after almost 20 years as The Food Fairy. She has gleefully spent decades flying around kitchens cooking, serving, creating love-filled food for local NC residents and now in the Catskills of New York as well. If you haven't yet met Terri, The Food Fairy or any of her offspring, (aka foodfairyettes), you still have time because she isn't done yet! In October The Food Fairy will begin her 20th year in business serving up personal chef daily-fare, party-time and cooking class services "once a week, once a month or every once in a while"! Try some "fairy food" and you will immediately know what delicious is! Whether it is common or rare specialty diets or fantastic cooking for an event, Terri is well known for her style, great attitude and nutritious preparation. "Saturday was so amazing in every respect. Your preparation was impeccable, everything was so beautiful and so good. Of course, I love knowing how carefully all the ingredients were chosen too! Jeff says that he thinks that was the best Food Fairy meal he has ever had and that is very high praise indeed!" Since 1996 , Terri, has trained over 20 women, mostly moms, to work their fairy magic in Triangle kitchens (and now New York)! Some, after studying with Terri for several years, began their own businesses. Two of them, Krystal Rosso-Feren and Becket McGough tried other careers and have returned to The Food Fairy staff with a total of 7 nurturing fairies now flying around kitchens, too. McClernon has also expanded to New York's Catskillls. Terri lived in Sullivan County, for 23 years before moving to NC. Her contacts there lead her to Kristen Rieber who is representing The Food Fairy in Sullivan, Orange, Ulster & Rockland Counties! Kristen, a mother of two, is a high energy, creative lady who is much like Terri 30 years ago, working to provide for her family. All fairies until now, have been women but Terri says she'd love to have a "Dude-Fairy" on staff when the perfect guy chef arrives. Even before the release of her innovative cook-a-long DVD, Cook-Once-Eat-For Weeks, Terri was encouraging families to eat together and to eat well even without a personal chef! Beginning in 2014, Terri became a consultant to Advanced Wellness Systems as they produce their nutrition and food module geared towards corporate wellness programs. advanced-wellness-systems.com. "I truly thrive when I nourish myself with new avenues for sharing my experiences and expertise." Terri said. When asked recently what she enjoys cooking the most she unveiled her love of creating the most memorable and tongue titillating meals for folks on severe elimination diets. Terri added, "I created this rice-scallop croquette from what the client had in her pantry and freezer and it was so delicious I proceeded to adapt it for others on similar restrictive diets but using chicken or shrimp as the protein. I eventually perfected it for the Clark-Reidy wedding with chicken or tempeh for vegans, filled with a dairy-free Thai Peanut Pesto and topped with a roasted mango basil sauce." Just this week Terri met Amanda Cushman who will take the lead position for in-home cooking classes, (one or more participants), which is Amanda's specialty. "This is truly what I love to do! ', Amanda told Terri over coffee at The Root Cellar, Chapel Hill.. Terri believes that finding folks who love what they do and putting them all together really makes a spectacularly strong and happy business.